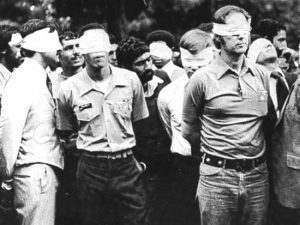 As a result of the U.S. administration being soft-hearted, soft-minded, and naive, Iran launched an Islamic revolution, and on November 4, 1979 52 American hostages were taken from the U.S. Embassy in Tehran and held for 444 days until President Reagan’s Inauguration Day. The following month, the Soviet Union invaded Afghanistan. President Obama’s administration appeased Iran and provided it billions of dollars in violation of federal law. This was done despite the recognition by the U.S. government that Iran is the most dangerous state sponsor of terrorism in the world, continues to aggressively pursue nuclear weapons, and makes it’s desire to destroy the United States and Israel clear. This is the same Koranic quote referenced on the International Muslim Brotherhood’s logo. Hassan Nasrallah, the leader of Hezbollah – a designated terrorist organization – reports to the Supreme Leader of Iran, Ayatollah Ali Khamenei. 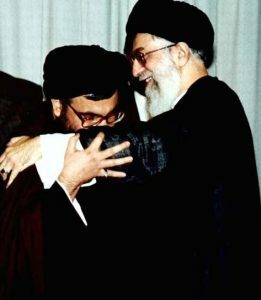 Hezbollah Secretary General Hassan Nasrallah kisses the sleeve of Iranian Supreme Leader Ayatollah Ali Khamenei, a sign of respect and deference. 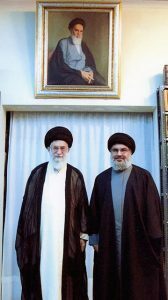 Iranian Supreme Leader Ayatollah Khamenei stands with Hezbollah Secretary General Hassan Nasrallah under a portrait of Ayatollah Khomeini. Additionally, senior Al Qaeda leader Khalid Sheikh Mohammed and his family lived in Iran. 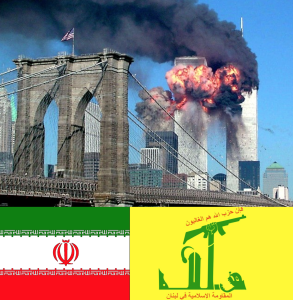 In 2012, the U.S. Treasury Department designated the Iranian Ministry of Intelligence and Security – Iran’s primary intelligence agency – for providing material support to Hezbollah and Hamas (TERRORIST organizations), for providing Al Qaeda operatives with documents (passports, ID), facilitating Al Qaeda’s movement in Iran, and providing weapons and money to Al Qaeda in Iraq during the war there. It is high time the United States government destroy Iran’s ability to wage war at all levels, including Hezbollah’s operations in Lebanon, Iran, and their cells here in the United States. In 1979, it was a Giant Mistake not to retaliate against Iran for their Act of War against the USA. The embassy is US property and as such we should have retaliated immediately! That would have put Iran on notice. Don’t F with US!!!! Carter was a winney! ? Same with Benghazi! Fortunately, in October of 1781 when British, and Hessian-mercenaries, under the command of Lieutenant-General Charles Cornwallis surrendered to a combined American & French force during the siege of Yorktown (Virginia), the office of “President of the United States” didn’t even exist. And (God forbid) had that erstwhile paradox not been the case, if considered in light of what has contextually ensued, the American Revolutionary War might never have even been fought, much less won, and thus signal the birth of a free nation no longer fettered to the whims of a tyrannical king of England residing in splendor an ocean away. Yet notwithstanding nine acts of war against the United States, committed during the consecutive tenures of the 39th through 43rd presidents and demonstrably attributable to a so called “general strategic goal of the Muslim-Brotherhood in North America” i.e. a “long term” clandestine plot approved in 1987, published in 1991, and by the grace of God seized by the FBI from a subterranean basement in Annandale, Virginia in 2004, all of our above, ludicrously referenced, “Commanders in Chief” have steadfastly insisted that said nine acts of war – which in aggregate have claimed in excess of 3500, mainly American, lives, were the result of random radicalization of disturbed individuals and are thus in no way threaded to the quintet of ideologies collectively known as “Islam”. Those five mortal contextual misfits who have by hook or by crook been elected to the American presidency are, in a word, sociopaths and despicable LIARS, each of whom should have been impeached for having effectively refused to protect and defend the American people in the self-serving interest of e.g. dynastic power, oil and lots & lots of MIDDLE-EAST MONEY. Again, lest we forget, the American war of independence – WHICH GAVE US THESE BLESSED UNITED STATES OF AMERICA – effectively began near the old North Bridge in Concord, Massachusetts when a Redcoat of the King’s 43rd Regiment of Foot on an ad hoc detail searching for weapons, panicked at the sight of 77 “Minutemen” deployed nearby (precursors of U.S. Marines and U.S. Army Rangers) and fired “the shot heard round’ the world” with his musket. The proportional differences in then & now are (or should be) sobering.